Use: For setting a piece of cloth into a shorter space, as an apron, petticoat, or drawers into a band, or ruffles into spaces planned for them. Fig. 99. - Running stitch, seaming. To work: Divide both the part to be gathered and that to which it is to be applied, into equal parts, eighths, quarters or halves, and mark with thread, either a few small running stitches or a crossstitch. The gathering thread should be a few inches longer than the space to be covered. Use either single or double cotton, number suitable to your material. Use a knot, and begin frorn one-quarter to three-eighth inch from the edge of material, taking a small back stitch to prevent possibility of the knot drawing through the cloth. FIG. 100. - Running stitch, tucking. When gathering, do not remove the needle from the cloth until the end of the space to be gathered has been reached. If the needle heroines crowded, push the cloth off at the eye of the needle, but do not remove the needle, The gathers should then be stroked or pulled ( Fig. 101). FIG. 101. - Gathering, material and band divided in section and marked. 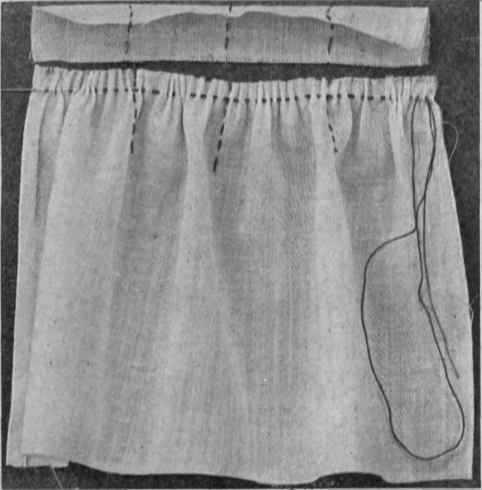 Place pin in skirt at knee; wind one end of gathering thread securely around pin; then holding gathered piece taut between thumb and first linger of left band, the cushion of the linger just below and parallel to the gathering thread on the under side, and thumb on gathering thread on upper side, pull the gathers with the right hand down over cushion and against thumb. 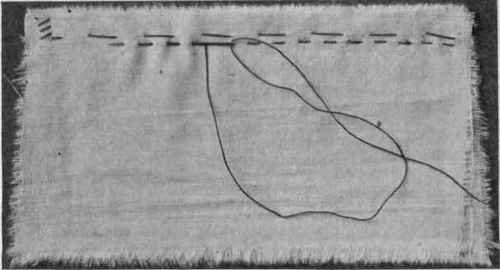 Gathers are made with (1) double thread, one row, or (2) single thread, two rows. 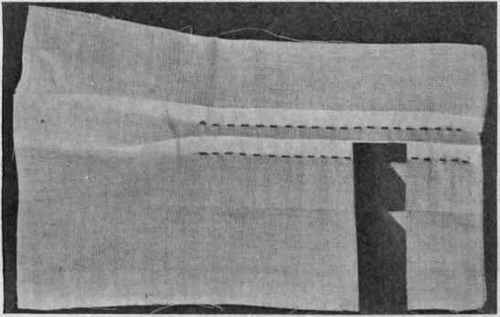 Plain gathers, for setting material into bands and ruffles under tucks or folds (Fig. 101). 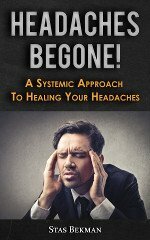 Used when there is a very great amount of fulness to be drawn into a smaller space. 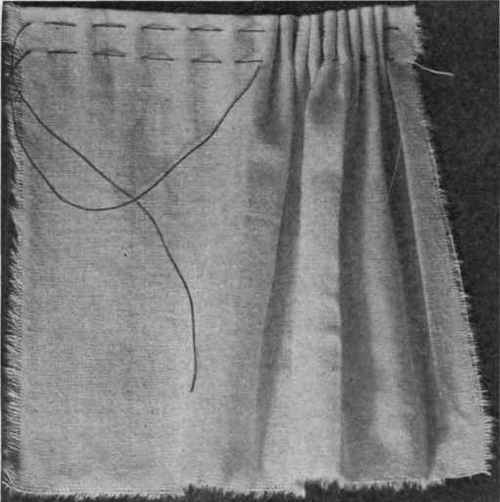 A large stitch is taken on right side of the cloth, a small one on under. Each stitch of succeeding rows must lie directly under the one above (Fig. 102).